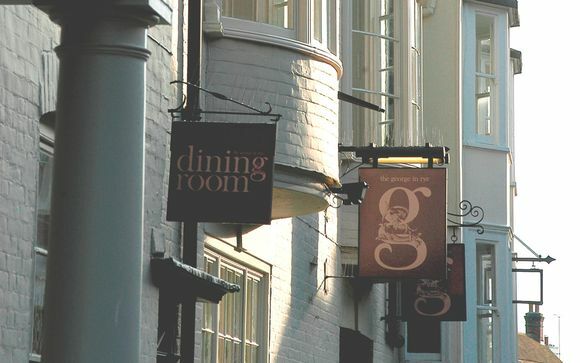 Expect unique bedrooms, a Josper grill restaurant and smiling service at The George, in the picture-perfect town of Rye, which welcomes not only a constant stream of actors (Matt Damon, George Clooney), but also locals and devotees of E.F. Benson and Henry James, who lived here. Located in the centre of Rye, East Sussex, The George in Rye is a recently renovated property with an enviable heritage dating back to 1575. Situated on the south east coast, it boasts an original Georgian ballroom, individually designed rooms and a superb restaurant offering fresh and seasonal food. This offer is based on a bed and breakfast stay with a dinner allocation of £50 to be put towards dinner from the a la carte menu. The hotel offers a restaurant and bar, The George Grill and The George Tap, offering all day dining options of modern, European cuisine with a Mediterranean twist. The restaurant succulent seafood, local meats and vegetables which are cooked on a wood-charcoal grill in the heart of the kitchen. Enjoy a regularly changing menu, which changes with the seasons in order to provide only the freshest ingredients. The bar offers a large range of wine by the glass, including those from the vineyards of East Sussex and Kent. A snack menu is also available in the afternoon for those who are feeling a bit peckish. Rye is 20 minutes' train journey away from Ashford railway station, which connects to London St Pancras using the high speed link (38 minutes) - it is therefore possible to get from St Pancras to Rye in just over one hour! Take M25 (anticlockwise) to Junction 5, then M26 (signposted Maidstone) to M20. Leave M20 at Junction 10 and take A2070 signed to Lydd and Brenzett. Follow A2070 to Brookland roundabout (Total petrol station) junction, then take A259 (straight on) signed to Rye and Hastings. This road continues onto Rye, where there is a town map. Take Junction 5 off the M25 down the A21 (signposted Sevenoaks and Hastings). At Flimwell, turn left onto the A268 (signposted to Hawkhurst). This road continues onto Rye, where there is a town map.